Argentina are in sixth place in the 10-team South American group, with only the top four teams qualifying automatically for Russia. 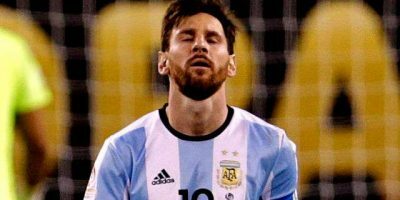 Will there be no Lionel Messi in World Cup 2018? Argentina are in serious danger of failing to reach the 2018 World Cup finals after being held to a 0-0 draw by Peru on Thursday. Messi’s side are on 25 points in sixth place in the 10-team South American group, with only the top four teams qualifying automatically for Russia. The fifth-placed side, currently Peru, qualify for a playoff against Oceania champions New Zealand. Twice champions and 2014 runners-up Argentina visit Ecuador at high altitude in Quito in the final round of matches on Tuesday while Peru, who are hoping to go to the finals for the first time in 36 years, host Colombia in Lima. Brazil have already qualified for Russia on 38 points, while Uruguay (28) need just a draw from their final game against Bolivia to advance. Chile are third with Colombia fourth, both on 26 points. Argentina have struggled for goals in a poor qualifying campaign in which they have been under three coaches. But it was not for want of trying, with Messi hitting the post, that they ended up with a third successive draw in qualifiers under Jorge Sampaoli. Argentina had the lion’s share of possession and chances although good ones were scarce. Messi had a shot from a corner taken by Angel Di Maria deflected wide by goalkeeper Pedro Gallese early in the first half and later skimmed the outside of the post with a shot from the edge of the box. In between, Peru might have taken the lead but Jefferson Farfan put the ball outside the near post from a low cross from the left. Argentina should have gone ahead in first half stoppage time when Messi lifted a looping cross into the box but striker Dario Benedetto headed the ball over the bar. Right from the restart, Argentina could have scored from two good chances. Messi hit the post after picking up a rebound off Gallese and the goalkeeper soon after leapt to save a long range effort by Lucas Biglia. Gallese also saved at point blank range from Papu Gomez and substitute Emiliano Rigoni was also wide after a run by Messi. Boca Juniors midfielder Fernando Gago came on for Ever Banega after an hour but lasted less than 10 minutes before twisting his knee and having to be replaced by Enzo Perez in Sampaoli’s last possible change. Peru striker Paolo Guerrero almost snatched a goal at the death with a free kick that Sergio Romero tipped over his bar. In the other matches, Uruguay failed to break down Venezuela in a 0-0 draw on Thursday and were left waiting to bag what looked a certain place at the 2018 World Cup finals. The Uruguayans, second in the South American group behind already qualified Brazil (38), are on 28 points and will hope to secure their berth at the Russia finals when they host Bolivia on Tuesday. Uruguay have a goal difference of +10 as opposed to +1 for both Peru and Argentina, who have 25 points after a 0-0 draw in Buenos Aires and could potentially join them locked on 28 points after next week’s matches. If Uruguay were to lose heavily to Bolivia and Argentina, who travel to Ecuador, and Peru, at home to Colombia, were to rack up big wins, they could fall out of the reckoning. Colombia and Chile, both with 26 points, hold the other two automatic qualifying berths with Peru in the fifth-place playoff spot having scored more goals than Argentina. It will be the first time in five qualifying campaigns this century that Uruguay have avoided an inter-confederation playoff. They have reached three finals via two-legged playoffs since 2002, but missed out on Germany 2006 after losing to Australia. Two goals in the last three minutes gave Paraguay a 2-1 win over Colombia to and ensured both teams are still in contention for the 2018 World Cup finals. Colombia were on top throughout and Radamel Falcao’s 78th minute goal appeared to have cemented their place in Russia. However, two late errors by Colombian keeper David Ospina, combined with a number of missed chances by the home side, allowed Paraguay to keep their own hopes alive. Ospina spilled the ball from a hopeful punt with two minutes remaining, allowing Oscar Cardozo to latch on to the loose ball and fire home. A minute into injury time the keeper failed to hold a low drive and Antonio Sanabria slotted home to give the visitors three points. The result means Colombia drop to fourth in the 10-team group, while Paraguay are in seventh. The top four teams qualify automatically for Russia and the fifth-placed side take on New Zealand in a play-off. Meanwhile, Chile survived a late scare to beat Ecuador 2-1 on Thursday as they moved into third-place in the 10-team South American qualifying group. Chile have perhaps the toughest task in their final match, against Brazil in Sao Paulo. The five-times world champions have never lost a World Cup qualifier at home. Alexis Sanchez stole the ball on the edge of the box and fed midfielder Jorge Valdivia and his pass left Vargas in space 12 yards out to crash the ball past keeper Maximo Banguera. Romario Ibarra equalised for Ecuador with eight minutes remaining but Sanchez was on hand three minutes later when Banguera could only parry a shot on the edge of the six-yard box. Sanchez then had the simplest of tasks slipping the ball home for the winner. Brazil were held to a 0-0 draw away to Bolivia in a World Cup qualifier on Thursday with home goalkeeper Carlos Lampe in outstanding form to frustrate the five-times world champions. Brazil have already having qualified for next year’s finals in Russia while second-bottom Bolivia are out of the running for one of South America’s qualifying places. The visitors had the best in a match played at high altitude and searing heat on a poor pitch that made neat play difficult. Lampe made several fine saves, particularly in the first half when he twice denied Neymar from close range and then kept out a point-blank shot from Gabriel Jesus. The keeper thwarted both players again in the second period, after Bolivia’s Diego Bejarano Ibanez rattled the bar in first-half injury time with a spectacular 30-metre strike. “We created lots of chances but the goalkeeper had a happy afternoon, he deserves our congratulations,” Brazil’s captain for the day Casemiro said after the game. Brazil lost Thiago Silva to injury after 28 minutes but were never in danger of losing their first competitive match since Tite took over as coach in June last year. Brazil are the only team to have played in every World Cup since the first tournament was held in Uruguay in 1930.